Rising from a rocky shoreline into hills covered by Monterey pines, Cambria has a spirit shaped equally by ocean and forest. Midway between Los Angeles and San Francisco, this Central Coast beach town boasts several miles of coastline and, especially in spring, is bordered by rolling hills green enough to evoke the Welsh origins of its name. 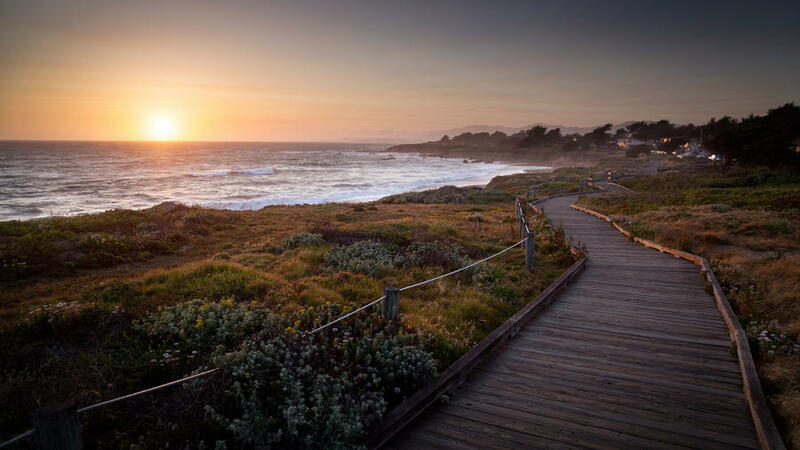 These days Cambria makes an ideal base for anyone looking for a weekend filled with long beach walks or hikes into the hills. Lily’s Coffeehouse. Head into the village for breakfast, where, on Saturdays, Lily’s Coffeehouse serves crêpes on its patio. $; 2028 Main St., Cambria 805/927-7259. Robin’s Restaurant. For lunch, Robin’s Restaurant has an eclectic menu that features daily salad specials and a flavorful salmon bisque. Its vine-covered patio is one of Cambria’s most appealing dining spots. $$$; lunch Mon-Sat, brunch Sun, dinner daily. 4095 Burton, Cambria. 805/927-5007. Linn’s Restaurant. Save room for dessert and stop at Linn’s for its country setting and famous olallieberry pie. Olallieberry? It’s a cross between a blackberry and a raspberry. $; 2277 Main St., Cambria; or 805/927-0371. Harmony Cellars. While Harmony’s old dairy town has seen busier times, you can watch glassblowing demonstrations, visit a pottery studio, and end your afternoon with wine tasting at Harmony Cellars. 3255 Harmony Valley Rd., Harmony; or 805/927-1625. If one restaurant hits the coastal trifecta of view, food, and wine, it’s the Sea Chest. The Central Coast it calls home may not get as much hype as Northern or Southern California’s, but we think the view is every inch as gorgeous. Settle in for seafood and local-wine pairings such as sweet, briny, plump Morro Bay oysters with a spritz of lemon and a delicate Curran Grenache Blanc. $$$; . The Sea Chest. The Sea Chest offers water views, knock-you-down-it’s-so-good seafood, and divine local wines. The sweet, plump Morro Bay oysters, with just a spritz of lemon, are addictively bracing. We fell for the sea bass, too. $$$; 6216 Moonstone Beach Dr., Cambria; 805/927-4514. French Corner Bakery. With bread bins and a Parisian street mural, the French Corner Bakery lives up to its name and is a good bet for a light breakfast, or for sandwiches at lunch. $; breakfast and lunch daily. 2214 Main, Cambria; 805/927-8227. Wild Ginger Cafe. For lunch, the Wild Ginger Cafe is a good bet for its Pan-Asian cuisine. $$; closed Thursdays. 2380 Main, Cambria; 805/927-1001. Tognazzini’s Dockside Restaurant & Fish Market. Those flexible on time can drive 20 miles south of Cambria for freshly caught oysters. This waterfront eatery serves them in myriad ways: barbecued with garlic-butter, Rockefeller style, fried, and raw on the half shell. $; 1245 Embarcadero, Morro Bay; or 805/772-8100. Ruddell’s Smokehouse. You may have enjoyed many fish tacos in your life, but nothing quite like what you’ll find at Ruddell’s Smokehouse. 15-miles south of Cambria sits this unpretentious joint, serving a changing assortment of smoked seafoods—ahi, salmon, and shrimp among them. The subtle and sweet smoke, plus toppings such as chopped apples, gives Ruddell’s tacos and sandwiches a memorable twist. $$; 101 D St., Cayucos. or 805/995-5028. Cambria Pines Lodge. The 26-acre woodland site provides a range of accommodations, from pine-paneled cabins to luxury suites; for the full floral experience, ask for one of the new bungalows with garden views. Stroll through the butterfly garden, organic kitchen plots, and the rest of the themed and unapologetically high-maintenance landscapes. Follow the trail to the on-site nursery to take home a few of the plants you fell in love with. $$$$; 2905 Burton Dr., Cambria; or 805/927-4200. J. Patrick House. In a forest setting, traditional bed-and-breakfast features cozy rooms with wood-burning fireplaces. Eight rooms from $175. 2990 Burton, Cambria; or 800/341-5258. Fogcatcher Inn. This seaside gem is located across the street from the sparkling shores of Moonstone Beach. Recently renovated, our new décor is as fresh as the ocean breeze that flows through our Cambria hotel. Enjoy driftwood-inspired headboards and warm yellow accents that reflect our coastal setting along Moonstone Beach. $$$$; 6400 Moonstone Beach Dr., Cambria; 805/927-1400. Cambria Landing Inn & Suites. Just seconds away from Moonstone Beach Cambria Landing Inn & Suites offers , and ocean view bungalows with jetted tubs. $$$ 6530 Moonstone Beach Dr, Cambria; or 805/927-1619. El Colibri. Settle into this Mediterrean-style boutique hotel on the south end of town. Its luxurious rooms, on-site spa, and easy trail access create a well-rounded, soothing experience. $$$$; 5620 Moonstone Dr., Cambria; or 805/924-3003. Hearst San Simeon State Park. One of the best day-hikes starts along the boardwalk at San Simeon State Park and heads into forests of Monterey pines and onetime ranchland. The 3- to 4-mile loop begins at a trailhead located just north of Cambria at Washburn Day Use Area. $; Van Gordon Creek Rd. at San Simeon Creek Rd., San Simeon or 805/927-2020. Of course you want to see —no trip up Highway 1 would be complete without a tour of William Randolph’s fabled hilltop estate. If you’ve visited before, we suggest getting a more intimate glimpse of the press baron on the Upstairs Suites Tour. Afterward, head down the hill to San Simeon, the tiny port that gave the castle its official name. Sebastian’s Store serves superior burgers (made from Hearst Ranch beef); across the street, San Simeon Pier and W.R. Hearst Memorial State Beach are both fine places to soak up a little sun with your views of the Pacific. Castle: From $25; . Sebastian’s Store: $; 442 SLO San Simeon Rd. ; (805) 927-3307. Hearst Castle. For all of the area’s simple charms, the Central Coast’s biggest attraction remains Hearst Castle, the grand vision of William Randolph Hearst. 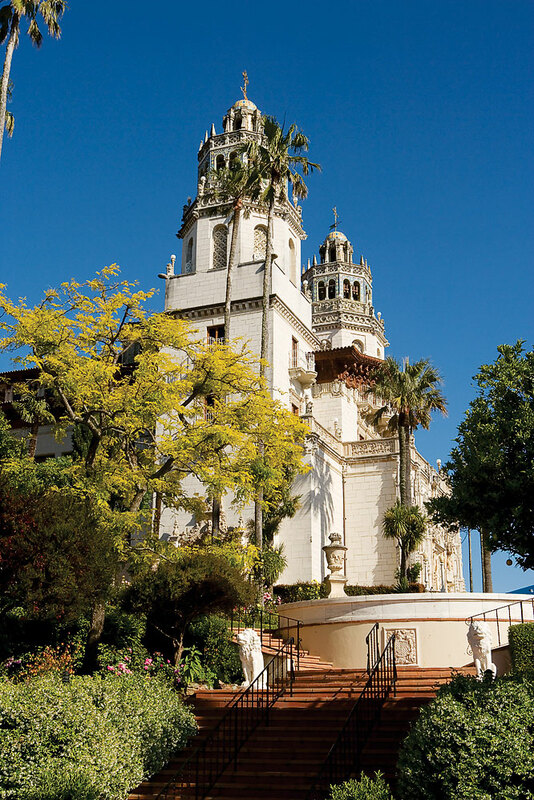 Designed by Julia Morgan, it holds Hearst’s assemblage of rare antiquities and art. $$$; 750 Hearst Castle Rd., San Simeon; or 800/444-4445. Kayak Horizons. Head out for a self-guided (rentals from $9 per hour) or guided ($55/person for 3-hour tour) paddle on the bay through Kayak Horizons. Either way, you’re likely to see dozens of the 100 or so bird species that call the bay home, and you’ll probably spot a frolicking sea otter or two, as well. $$; 551 Embarcadero, Morro Bay; or 805/772-6444. Piedras Blancas Light Station. Twelve miles north of Cambria, you can visit the noteworthy elephant seal viewing of Piedras Blancas. While you’re there, take a tour of the age-old light station built in 1875. $; 15950 Cabrillo Hwy, San Simeon; or 805/927-3719. Moonstone Beach. The ideal start to a Cambria day is a walk at Moonstone Beach. You can take the boardwalk that follows the bluffs or walk along the beach, named for the white agates sometimes found here. Along Moonstone Beach Dr. off Windsor Blvd. W.R. Hearst Memorial State Beach. After exploring Hearst Castle grab a hearty sandwich from Sebastian’s and picnic at this beautifully, quaint beach. $; 750 Hearst Castle Rd., San Simeon; or 805/927-2020. The Garden Shed. This home and garden store has a nice selection of pots and accessories. It’s hardly a shed, though. It’s more like 6,000 square feet of whimsy, jam-packed with tools, fountains, and sculptures to help complete your own garden’s decor. $$; 2024 Main Street, Cambria; or 805/927-7654. Cambria Nursery. The beach town’s nursery offers monthly demonstrations and workshops at its rambling flower and gift shop above town. Even if you have no need for cut flowers or potted plants during your visit to the Central Coast, stop by just to ogle the offerings–it’s like visiting a botanical garden for free. $$; 2801 Elton Rd. ; Cambria or 805/927-4747. Home Arts. The eclectic items at Home Arts include Oaxacan weavings and cute ceramic pitchers. You can decorate any room of your home by selecting from the store’s wide-ranging array of furnishings, bed and bath accents, and even books. $$; 727 Main Street, Cambria; or 805/927-2781. The Shop Next Door. This spots hosts offers traditional Amish, Shaker, and Mission furniture designs. The building was constructed in the 1880s, and it can sometimes be hard to tell the actual vintage pieces from the charmingly old-fashioned new wares. In short, this is your go-to spot for classic home furnishings made in the days when craftsmanship counted for something. $$$; 4063 Burton Drive, Cambria; or 805/927-9600. Check out our Insider guide to the Central Coast for more fun things to do in the area.